The Global Infrastructure Programme (GIP) aims to improve the provision of sustainable and resilient infrastructure as a critical enabler for economic development in middle income countries. It will help to address the global infrastructure investment gap; despite there being significant funds available, it is estimated that there is a shortfall of $3.7 trillion a year. The Five Case Model (5CM) - improves business case development and planning. Published by HM Treasury, the 5CM is a business case management tool which is developed over time as a living document as a programme or project proposal is developed. In its final form it becomes the key document of record for the proposal, also summarising objectives, the key features of implementation management and arrangements for post implementation evaluation. The Project Initiation Routemap (PIR) - helps sets up projects and programmes for success. PIR is a practical tool to support the initiation phase of a project by applying learning and best practice to address many of the common challenges faced by projects in its early stages. This helps to minimize cost overruns and programme challenges later in the project lifecycle. It also provides valuable material to feed in to the business case and practical solutions to help a project move forward. It has been used on the UK’s most important infrastructure programmes worth over £200 billion. Building Information Modelling (BIM) - a collaborative approach through digital technology. 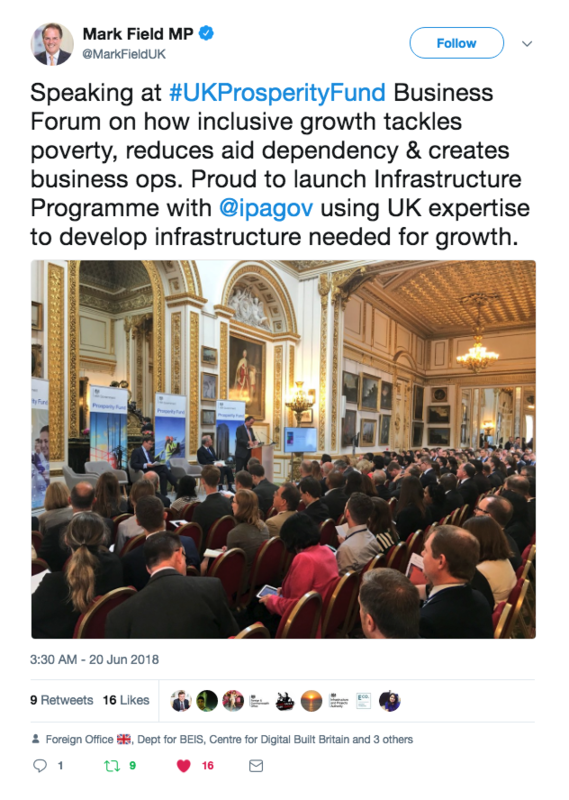 In order to address costly inefficiencies and delays during project delivery, the UK introduced new digital techniques such as BIM and standards on public construction projects. BIM supports the efficient design, delivery and maintenance of infrastructure and buildings. The data generated is also available to help others in the supply chain to make more informed decisions to improve productivity and reduce waste. The programme team has already been working hard with the British Embassy Bogotá, British Embassy Jakarta and British Embassy Hanoi to develop relationships and begin delivery of the programme in Colombia, Indonesia and Vietnam. This work led to the signing of memorandums of understanding with government authorities in all three countries, providing an important platform to continue the work of the GIP. 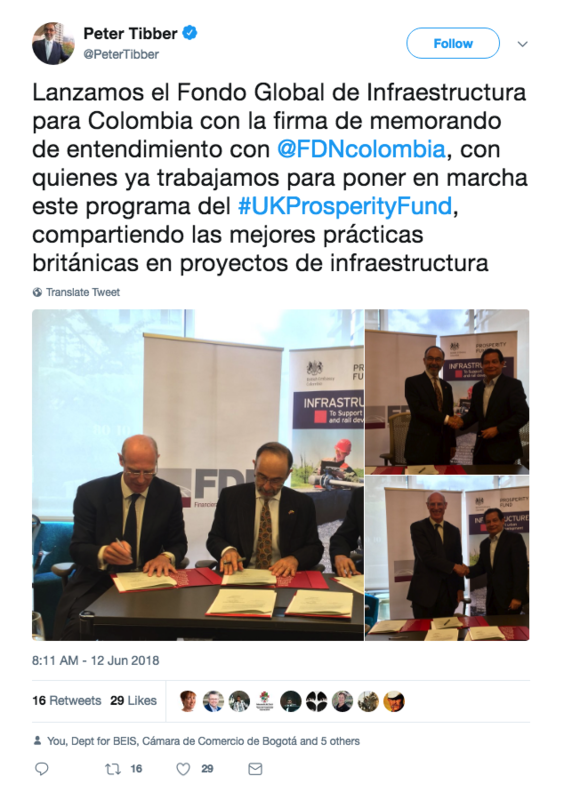 On 12 June 2018, British Ambassador to Colombia, Peter Tibber and Head of International at IPA, James Ballingall signed a memorandum of understanding with the President of Financiera de Desarrollo Nacional - Colombia, Clemente del Valle Borraez to formally allow the programme to enter its in-country delivery phase in Colombia. 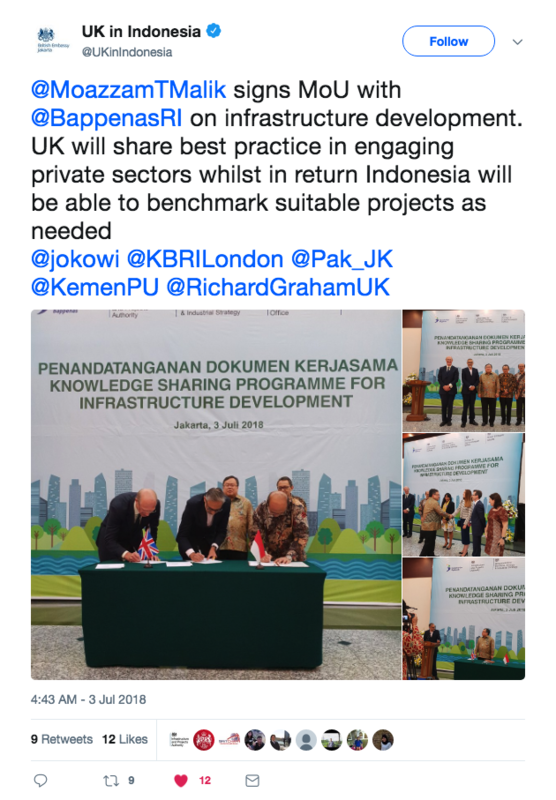 On 3 July 2018 British Ambassador to Indonesia, Moazzam Malik and CEO of IPA, Tony Meggs signed a memorandum of understanding with the Deputy of Infrastructure - BAPPENAS, Wismana Adi Suryabrata, to formally agree common goals and begin the delivery phase. On 05 July 2018 Stephen Lysaght, Chargé d'Affaires of British Embassy Hanoi, witnessed by Baroness Fairhead, Minister of State for Trade and Export Promotion at the Department for International Trade, signed a memorandum of understanding with Nguyen Van Sinh, Vice Minister of Construction and Pham Khanh Toan, Director General of International Cooperation Department for collaboration and knowledge exchange on the introduction of Building Information Modelling. The programme will start delivering training and guidance on the three methodologies to Colombian, Indonesian and Vietnamese officials. In the past two months the programme team have already been out to Indonesia and Vietnam to deliver training and run workshops on the methodologies with a number of follow up trips planned for the future. While the Programme has so far focussed on these three countries, we hope many more will benefit. We have received interest from other countries and multilaterals around the world looking to join the programme, so we look forward to keeping you updated on any new developments. In the meantime, find out more about how we work with over 60 different governments around the world on their infrastructure and financing methods.